MISN had the honour and pleasure of hosting Sergio Campusano here in Toronto this past week, and accompanying him to four events in four (very busy) days – the Barrick, Goldcorp, and New Gold shareholder meetings, and the large annual May Day convergence. 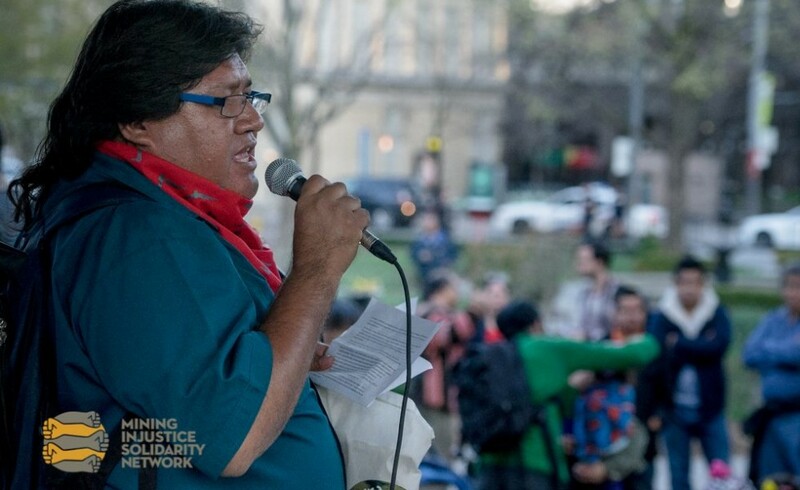 Sergio is president of the Diaguita Huascoaltinos Indigenous and Agricultural Community in Northern Chile. For those who were unable to hear Sergio speak to the thousands gathered for the May Day march, we are sharing a transcript of his speech here. “Brothers and Sister, comrades in our fight, activists and conscious people from every walk of life, I am here today to bear witness and inform you about you what is happening in the lives of my people. For those who do not know, we have been persecuted doggedly for more than 500 years from all those who have tried to defeat us through colonialism and steal our land. Two centuries ago, it was the Spanish. Today it is the multinationals with their souls of steel, those who want to take our lives out from under our feet, all for the selfish whim for a few sparkling rocks. If before these vile thieves used the sword and the cross to condemn us, now it is the bulldozers and the money that has come to poison our souls and separate us from our communal sense of life. Today on the day of you, the workers, of all of us, allow me to remind you of the indigenous definition of what “work” means. Work is a synonym for what we can do for others, of all of us working together in unity. However, today, work only means giving your lungs to a boss who tells us that “work” means “growth”, “generation of material wealth” and “profit creation” because they put a price on our obligatory dedication, for which there is a schedule attached to our time and a puny wage for our work, so that somehow whatever we have earned is spent again at any other of the many companies that they also own. Hermanas y hermanos, compañeros de lucha, activistas y gente conciente sin importar del bando que sea, las líneas que aquí exponemos, cumplen con el fin de informar y testimoniar sobre el acontecer de nuestro existencia. Para los que no saben, hemos sido persecutores incansables, desde hace más de 500 años de todo quien ha intentado por medio del colonialismo, arrebatar nuestras tierras. Hace dos siglos fueron los Españoles, hoy son las multinacionales, con su alma de hierro, las que desean despojarnos de nuestras vidas, de nuestras casas, de nuestros animales, sólo con el fin egoista de conseguir un puñado de piedras brillantes. Si antes, estos viles ladrones utilizaron la espada y la cruz para condenarnos, hoy son las retroexcabadoras y el dinero el que viene a envenenar nuestras almas y separar nuestro sentido comunitario. Fuerza hermanos… Dignidad por sobre Todo. La gradeza de un Pueblo no se mide por el número de habitantes, se mide por la valentía de su gente.